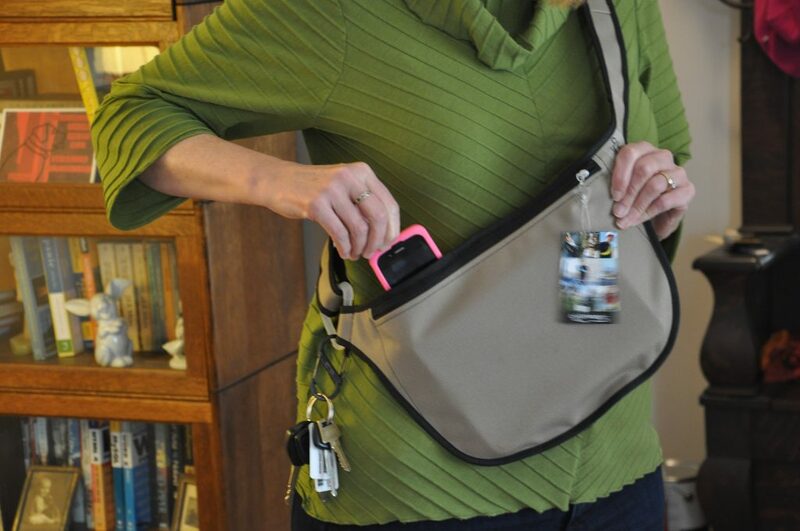 When we’re out and about, most Gadgeteers carry a few things: smartphone, wallet, keys, tablet. Maybe a tin of mints. Oh, sure, if we’re gone for the day, we’ll have a bag of other stuff including power adapters, charging cables and batteries, energy bars, and enough EDC stuff to survive a moon landing. But when you’re just gonna bike to the library or the bank, or run out for lunch, do you still grab all that stuff? The folks at Quivvers think not. They have designed a variant of Robin Hood’s tool carrier in two sizes for more modern tools. I was sent a black & brown “Big Rig” model to test. Note: Click or tap to view a larger copy of images. Minimalism is great, but just how far can you pare stuff down? The Quivvers tagline is “Technical. Minimal. Versatile.” And, in many ways, this bag is all those things. Structurally, it’s very simple: two sides – one with a 10.5×7″ pocket, and the other with two pockets (4×7″ and 6×7″). And, yes, you’re right, there is no depth measurement given. This is for flat items only. Attached to either end is a strap to go around your body, and you’re pretty much there. The strap is adjustable, and there’s a silicon triangle holding one side of the strap to the bag while the other is sewn-in. The two-inch regular triangle attachment point can hold (and is equipped with) a carabiner (well, an S-biner, which has clips at each end) for keys, ID cards, water bottles, or anything else you want to hang on there. The bag isn’t thick at all, basically two pieces of fabric sewn along the edges and finished with binding tape, so you’re not going to fit in a change of clothes, a bulky camera, or even most non-tablet power adapters. But when you’re doing a quick outing, do you really need that? This isn’t your spend-the-afternoon-working-at-the-coffee-shop-with-good-wifi bag, it’s your errand-runner. 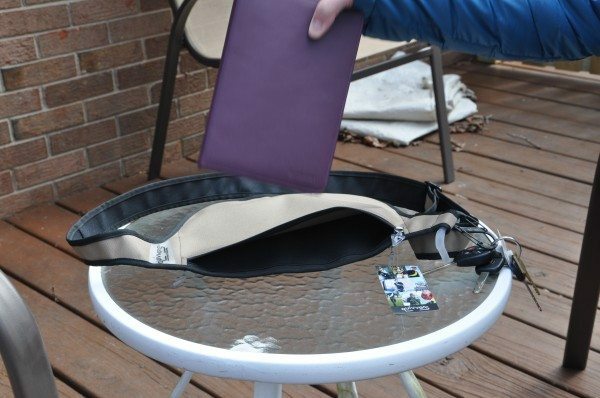 If you’re gone long enough to need a charger, or even a battery pack, re-think taking this bag. The construction and fit/finish all show attention to detail: The logo is on a waterproof, clear tag – easily flippable but it’s also not going to fray if you leave it on. The center section is two layers of fabric, neatly tucked under on every edge. I could not find a single fabric edge anywhere in this bag. All zippers are not only stitched in, but also top-stitched again in a square pattern that highlights the design, while adding to the durability. Pull tabs on all zippers are small regular triangles molded of a translucent plastic. They are attached with a stamped metal ring and tab shape, bent around the plastic. The zippers have no openings like other zipper heads, so the thin zipper pull loop isn’t going to slip out over time. They are a good quality bare metal, which slides easily over the nylon, self-healing teeth. 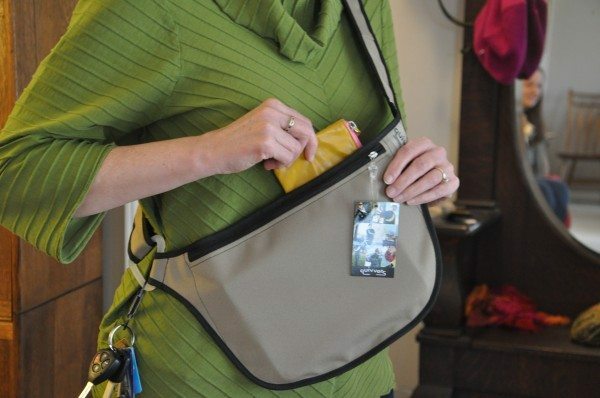 If you’re hitting the town on your bike and have other items in a pannier or basket, and just need your essentials close at hand, this is a great carrier. Stop to answer a call, check directions in a guidebook, snap a pic or two with your phone or tablet, put on a coat of lip balm, and hop back to it. 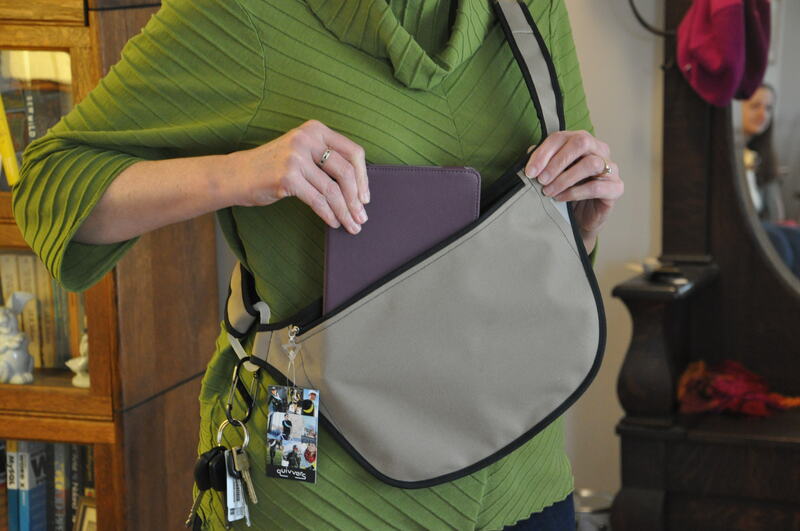 Strapped across your chest or back, this bag is easy to access and is so thin and non-bulky, that it can’t get in your way. You can easily wear it under bulky outerwear, which prevents that tangled-in-the-scarf-and-hood scene when you enter that warm lunch spot after a brisk walk from work. You can wear it across your left or right shoulder, but that will change both the color and which pocket(s) face outward. Both sides are easy to access, however, so it’s really just a matter of personal comfort or preference. 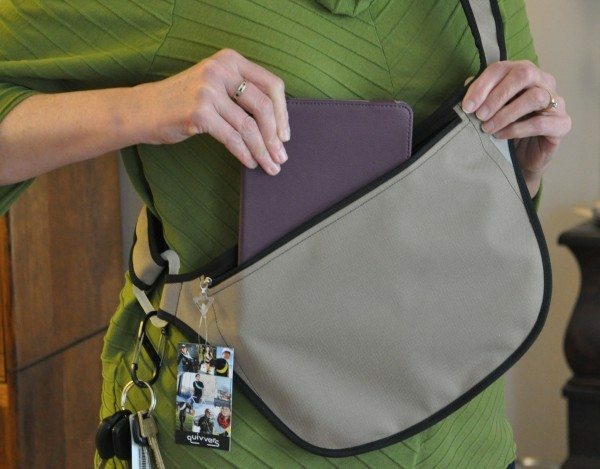 I used this bag for a few library trips, but not having a tablet that can fit into the large pocket, I found myself wanting a larger size so that my third generation iPad could fit in. It’s actually making me want to try out an iPad Air or iPad mini with Retina Display. It’s not exactly Chewbacca’s bandolier, but it’s not a fanny pack, either.